In a large bowl, whisk together flour, baking powder, baking soda, cinnamon, nutmeg, salt, and ground cloves. In another large bowl, whisk together sugar, oil, eggs, and vanilla until smooth. Stir in carrots and currants. Add flour mixture and mix together using a rubber spatula until mixture is just combined. Pour batter onto baking sheet and spread out evenly with spatula. Bake for 15 to 18 minutes, until center is firm to touch. Let cool in pan for 5 minutes. Invert cake onto a wire rack (do not remove parchment) and then reinvert onto a second wire rack and let cake cool completely. For the Frosting: Using an electric mixer with paddle attachment, beat together butter, sugar, buttermilk powder, vanilla, and salt on low speed until smooth, about 2 minutes. Scrape down sides of bowl as needed. Increase speed to medium-low and add cream cheese, 1 piece at a time. Mix until smooth, about 2 minutes. Transfer cake to a good cutting surface, parchment paper side down. Using a long knife, cut cake into 4 equal rectangles. Place one cake piece on a cake stand or plate. Spread about 2/3 cup frosting on top. Repeat with remaining layers. Spread frosting on top and sides of cake. 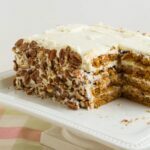 Using hands, gently press pecans onto sides of cake. Chill for at least 1 hour before serving.